660 E. Hallandale Beach Blvd. Whatever your dental problem, Dolphin Dental Care can be your solution for a lifetime! 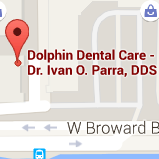 Call our Plantation or Hallandale, FL dental offices to schedule your first appointment! I feel privileged to work with such an excellent group of professionals. My wonderful staff is an impressive collection of dedicated individuals who care about each and every one of our patients and strive to help our patients maintain healthy standards of dental health which will, in the long run, benefit their overall health. It is great to work with them every day. I am thankful for the knowledge and capabilities that I have acquired and the experience I have gained over the years. My continued education allows me the opportunity to gain an even greater ability to assist my patients and bring them the confidence and health that they entrust in me and my team. It is important that my practice stays on the cutting-edge of all the ever-evolving trends, treatments, and techniques within the dental field, and for this reason, continuing education isn’t an option – it’s a necessity. Each year I attend many courses, seminars, and study groups that cover many unique areas of study, and our whole team is required to attend continuing education courses to ensure that each person in my practice is highly-skilled, proficient, professional, and at the top of the game. We do all of this for the benefit of our patients because we want nothing but the best for each of them. 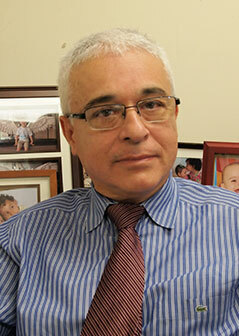 I grew up in Bogota, Colombia, and moved to New York where I lived for 23 years before settling in Aventura, FL. My wife’s name is Cristina and we have been happily married for 36 years. We have three wonderful children named Angelica, Andres, and Jimmy, and five beautiful grandkids: Sebastian, Valentina, Christian, Isabella, and Natalia. Our Maltese, Lucas, keeps us company at home as well. When I am not in the office you will usually find me with my family. I am lucky to have all my grandchildren living locally because I get to spend quality time with them and watch them grow. I am passionate about and love music, enjoy the Arts, history, reading, cooking, and traveling to learn about different cultures. 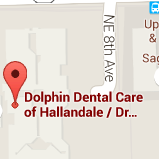 Review our Dolphin Dental Care Plantation and Hallandale Office on Google +!